As of 2009, more than 10 million American adults were morbidly obese, according to an article published in "Archives of Surgery." A morbidly obese person has a body mass index of 40 or more, while a super morbidly obese individual's BMI is 50 or more. Super morbid obesity increases the risk of cardiovascular disease, gout, osteoarthritis, gallbladder disease and early death, and patients often find that conventional weight loss measures are unsuccessful. BMI, a number calculated from an individual's height and weight, correlates to the person's body fat. BMI does not measure fat directly but it is often a good estimate of the percentage that would be round using direct body fat methods of measurement. Used as a screening tool, BMI serves as an indicator that the individual needs further assessment by a health care provider to determine if he is overweight or obese. More direct methods of body fat measurements, including skin-fold thickness measurement, underwater weighing, dual-energy x-ray absorptiometry and isotope dilution, are more expensive or require special training. BMI categories help evaluate the degree of obesity in a particular person. A person with a BMI of 18.5 to 24.9 is considered to be in the healthy range. An individual with a BMI of 25 to 29.9 is considered overweight, and a person with a BMI of 30 or more is considered obese. A person with a BMI of 40 to 49.9 is morbidly obese and an individual with a BMI of 50 or more has super obesity or super morbid obesity, according to a 2009 article published in "Archives of Surgery." Super obese individuals, those with a BMI of 50 or greater, may carry 150 or more excess pounds on their bodies. For example, a healthy weight for a person 5 ft. 7 in. tall is 121 to 153 pounds. A person of the same height with a BMI of 50 would weigh approximately 319 pounds -- 166 to 198 pounds more than a person in the healthy weight range. 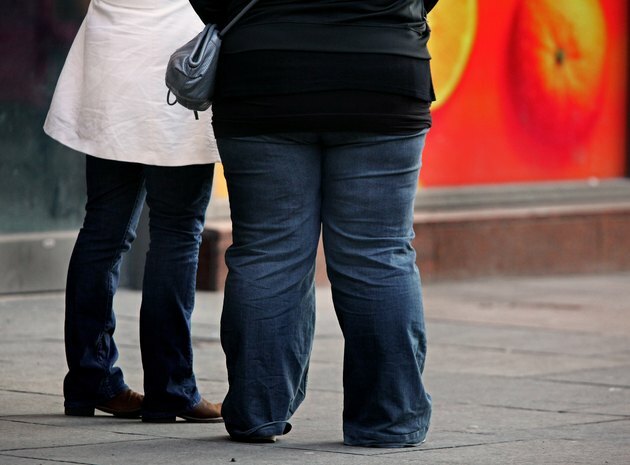 Morbid obesity was responsible for 82,066 deaths in 2000, according to a 2009 article in "Archives of Surgery." Morbidly obese individuals are at higher risk for high blood pressure, digestive diseases, kidney stones, diabetes, gallstones and joint pain, and their life spans are reduced by an estimated four to 20 years. Treatment for super morbid obesity may include a very low-calorie diet supervised by a physician and accompanied by an exercise rehabilitation program, but weight loss surgery offers better long-term results. Unfortunately, super morbidly obese individuals are more susceptible to postoperative complications, according to a 2009 study, and are more likely to get blood clots, wound infections, hypertension, obstructive lung disease and complicated diabetes mellitus.